then you are cordially invited to the Grand Opening of Online Sunisthefuture Store http://sunisthefuture.logosportswear.com (keep in mind that there is no “www” in front of sunisthefuture.logosportswear.com). our Sunisthefuture Team at Kiva ( http://www.kiva.org/team/sunisthefuture ) with your Facebook-, Twitter-, Google-, Yahoo- friends, family, co-workers, and fellow Solar Enthusiasts. Let’s speed up the process of moving toward a Renewable and Solar Future, a cleaner, healthier, and war-free world ! People! People! My belief/suspicion has been confirmed ! Solar Industry is going to be BIG! Huge! In time, solar energy will no longer represent less than one percent of our energy portfolio. If I were to wager on the matter, I’d bet that solar energy will eventually take care of more than 50% of our energy needs…just wait…in 10-20 years…. Jeffery Halsy shared that homeowners from his community, due to their participation in the SunShot Initiataive’s Rooftop Solar Challenge, were able to save time and money on installations by addressing the soft costs (including permitting, interconnection, and inspection requirements accounting for as much as 40% of the total cost of a single solar installation). With preapproved design plans,Broward County residents are now able to get a solar energy system permit online in just half an hour, saving both time and money. Jeff Allen shared insight on how Solar Junction shattered an existing technical barrier with its commericia-ready SJ3 multijunction solar cell this year. Below, on the left, a graph of Bandgap vs. Max. Efficiency shows the Shockley-Queisser limit for efficiency of a single junction solar cell. It is essentially impossible for single-junction solar cell, under unconcentrated sunlight, to have more than 34% efficiency. Multijunction cell, however, can exceed that limit. 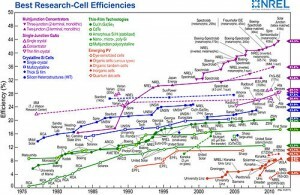 The chart on the right below indicates various solar cell efficiencies researched and presented by NREL (National Renewable Energy Laboratory). The SJ3 multijunction solar cell, with its concentrating PV cell, using a focused lens to magnify light to 418 times the intensity of the sun, was able to set a new world record of 43.5% for solar cell conversion efficiency. Shockley-Queisser limit for the efficiency of a single junction solar cell. It is essentially impossible for a single-junction solar cell, under unconcentrated sunlight, to have more than ~34% efficiency. A multijunction cell, however, can exceed that limit. Joe Demond talked about Ivanpah Solar Generating Complex in California’s Mojave Desert;this utility-scale solar installation is the world’s largest solar thermal power plant under construction. Supported by an Energy Department loan guarantee, this project using mirrors to focus the power of the sun on solar receivers (through high temperature high pressure steam to turn the turbines) and is expected to generate enough electricity to power about 140,000 homes annually. Bright Source hired over 2,300 workers to complete this project’s construction and installation phase. Furthermore, majority of this project’s supply chain comes from more than 17 states (such as Michigan-based Guardian Industries that supplied 160,000 of its EcoGuard Solar Boost mirrors). View of Ivanpah Solar Electric Generating System from Yates Well Road, The Clark Mountain Range can be seen in the distance. Evidently, SunShot Initiative has already accomplished a great deal in reducing the soft costs, in developing new approach in technological advancement, and improvement of old way of doing things to utility-scale. It will continue its aim in reducing the cost of solar energy to be competitive with any other form of energy, without the need of subsidy. The future looks bright for solar industry. The potential of reaching below $1/watt is within reach;cost of solar will be comparable to the new cost estimate of energy from natural gas within 10 years, without any need of subsidy. As Secretary Chu indicated, “Without any subsidy, solar energy will be able to hold its own with any other form of energy. 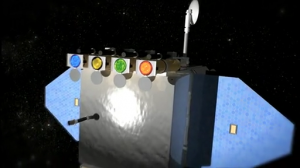 This is our SunShot! We’re going further than reaching the moon. We’re reaching for the Sun!”This is very exciting! It is so palpable that all solar enthusiasts can feel the energy soaring…now we need to spread this good news so to speed up the process of reaching that clean, healthy and war-free Clean Energy World. Earthlings, get ready to learn more about Solar Energy so we can all apply ourselves in this Solar Future! Thank you, Secretary Chu, for making SunShot Initiative a reality! As a result of posting The Unexpected Atmospheric Intruder on Feb. 16, 2013, I’ve received multiple questions/concerns expressed by our viewers toward the space and our Sun. 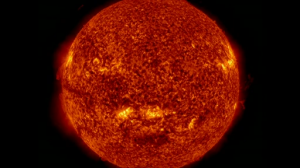 Therefore, I’ve prepared this particular session on “Understanding Our Powerful Sun & Its CME(coronal mass ejection)” for your viewing pleasure, to further our appreciation of our Sun, and to kindle our curiosity and wonder for exploration into the space. 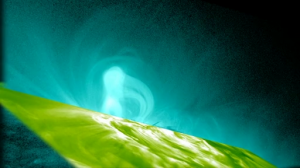 With the help from NASA Heliophysics (meaning Physics of the Sun), I’d like to present to you this composite of 2 footage about the Sun, the star at the center of our Solar System, and its CME (coronal mass ejection), the massive burst of solar wind and magnetic fields rising above the solar corona or being released into space. Be sure to stay long enough to also view the activities of CME. Can you feel the light and intense warmth projected from the screen…from this giant active star ? 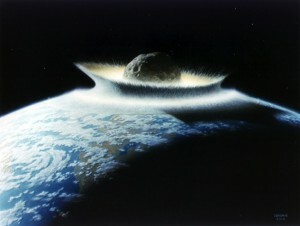 While the origin and sustenance of life here on Earth are intimately connected to this active star of over 4.6 billion years, our fate in the next 4+ billion years will depend much on our ability to understand and predict Sun’s variability in producing streams of high energy particles and radiation that can help/harm life on Earth or alter its evolution. 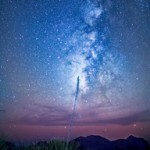 Better understanding of the connections between the Sun, solar wind, planetary space environments, and our place in the Galaxy would enable us to uncover the fundamental physical processes occurring throughout the Universe and allow us to predict the impacts of solar variability on humans, our technological systems, and the presence of life here on Earth. Since heliophysics is simply too vast a field to cover in one post, we will be concentrating in some basic understanding of the Sun and its coronal mass ejection (CME) in this one. with a diameter of about 1,392,684 km (about 109 x that of earth) and a mass about 2 x 10^30 kilograms (about 330,000 x that of earth). It accounts for almost 99.86% of the total mass of the Solar System. Chemically, about three quarters of the Sun’s mass consists of hydrogen while the rest is mostly helium…and the remainder (about 1.69%) consists of heavier elements such as oxygen, carbon, neon, iron, etc. The Sun formed from the gravitational collapse of a region within a large molecular cloud. Most of the matter gathered in the center, while the rest flattened into an orbiting disk that would become the Solar System. The central mass became increasingly hot and dense, eventually initiating thermonuclear fusion in its core. It is thought that almost all other stars form by this process. The Sun’s stellar classification, based on spectral class, is G2V, and is informally designated as a yellow dwarf, because its visible radiation is most intense in the yellow-green portion of the spectrum and although its color is white, from the surface of the Earth it may appear yellow because of atmospheric scattering of blue light. 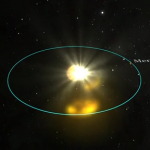 In the spectral class label, G2 indicates its surface temperature of approximately 5778 K (5505 °C), and V indicates that the Sun, like most stars, is a main-sequence star, and thus generates its energy by nuclear fusion of hydrogen nuclei into helium. 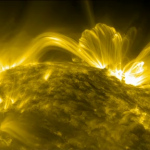 In its core, the Sun fuses 620 million metric tons of hydrogen each second. The Sun (the star closest to Earth, approximately 149.6 million kilometers away or the distance that light travels in 8 minutes and 19 seconds) is brighter than about 85% of the stars in the Milky Way galaxy. 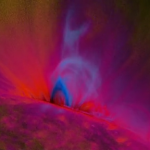 Coronal mass ejections (CMEs) release huge quantities of matter and electromagnetic radiation into space above the sun’s surface, either near the corona (sometimes called a solar prominence), or farther into the planet system, or beyond (interplanetary CME). The ejected material is a plasma consisting primarily of electrons and protons, but may contain small quantities of heavier elements such as helium, oxygen, and even iron. The theory of heavier element emissions during a CME is speculative information and requires further verification. It is highly unlikely that a CME contains any substantial amount of heavier elements, especially considering that the sun has not yet arrived at the point of helium flash and thus cannot begin to fuse elements heavier than helium. Coronal mass ejections are associated with enormous changes and disturbances in the coronal magnetic field. They are usually observed with a white-light coronagraph. 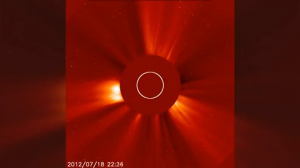 Recent scientific research has shown that the phenomenon of magnetic reconnection is responsible for CME and solar flares. Magnetic reconnection is the name given to the rearrangement of magnetic field lines when two oppositely directed magnetic fields are brought together. This rearrangement is accompanied with a sudden release of energy stored in the original oppositely directed fields. 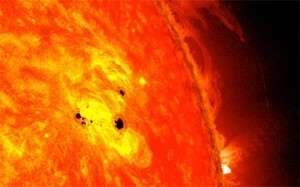 Most ejections originate from active regions on the Sun’s surface, such as groupings of sunspots associated with frequent flares. Near solar maxima the Sun produces about three CMEs every day, whereas near solar minima there is about one CME every five days. leaving a helix of magnetic field unconnected to the rest of the arcade. The sudden release of energy in this reconnection causes the solar flare. 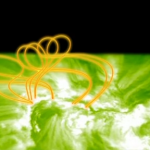 The unconnected magnetic helical field and the material that it contains may violently expand outwards forming a CME.This also explains why CMEs and solar flares typically erupt from what are known as the active regions on the sun where magnetic fields are much stronger on average. I hope you enjoyed viewing/reading this piece as much as I had in researching and composing this piece. On more than one occasion, during my years of travel, I’ve often been disappointed by the tremendous amount of unused surface areas of rooftops and carports as the plane descend at each and every city in USA. It always struck me as such a waste of real estate. 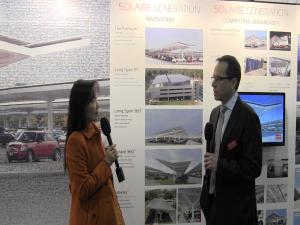 That is why it is my pleasure to bring you a short introduction of Solaire Generation, for it specializes in transforming outdoor parking lots into beautiful solar power plants. Solaire Generation installed a 3.6 MW Premium F1 canopy system for Dow Jones, the largest corporate solar parking project in the USA. Rutgers University installed a 8 MW Solaire 360 solar carport structure, one of the largest solar parking projects in the world. 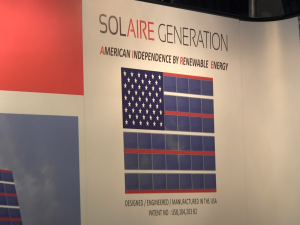 As Solaire Generation continues being recognized as the leading innovator in the market for solar structures and system by the US military and major universities, I wish Solaire Generation success in helping to pave the way for American Independence by Renewable Energy, as intended by SOLAIRE GENERATION. Let’s hope that as time progresses, there will be greater streamlining of the soft costs such as the permitting process. More inter-state collaboration would be helpful in accomplishing this task. 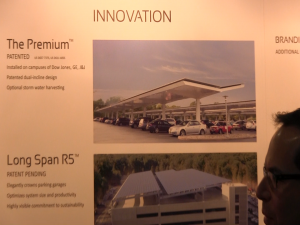 I will look forward to seeing many many more covered carports, generating solar power. Perhaps I won’t be as disappointed in the future as the plane descends in US cities. Amazing! It can be installed in just 20 minutes! 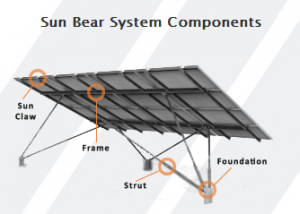 Panel Claw is now accepting orders of Sun Bear on projects and expects to begin shipping in April, 2013. This very intuitive design will further Panel Claw’s mission to accelerate adoption of PV worldwide with its simplified construction, with pre-assembled components, and zero loose fasteners. Carmine A. Tilghman of Tucson Electric Power Helps Us To Use More Solar Energy ! There are still more valuable interviews to be shared with you from my trip up to the Philadelphia, PA last week. 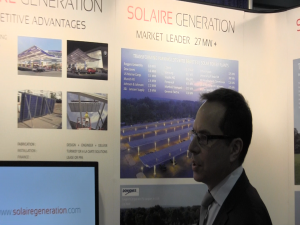 Today’s post is an interview with Carmine A. Tilghman, Director of Renewable Resources & Programs at Tucson Electric Power, during PV America East 2013, in Pennsylvania Convention Center of Philadelphia, PA.
Mr. Tilghman commented on how Tucson Electric Power (a UniSource Energy Company) worked collaboratively with University of Arizona, Arizona Research Institute for Solar Energy (aka AzRISE), and various other entities for grant opportunities (such as IBM and other universities, research institutes and developers). Such collaboration is very instrumental in promoting solar and renewable energy use to the next level. He also mentioned a recent “leasing model” that addresses the main concern or challenge of consumers in dealing with cost effectiveness of implementing solar energy. Furthermore, the dramatic drop in cost of solar energy makes it much more affordable for every one. Therefore, the larger integration of distributed generation as well as utility scale projects will continue to provide plenty of opportunities and challenges to utility companies. As the utilities move forward to meet the various RPS standard in different states, utilities will continue to operate the grid while meeting reliability criteria and providing the reliable service enjoyed by consumers. Some challenges faced by installers or developers, such as regulatory uncertainty, back lash, or recession have been overcome. Some clarification for RPS (Renewable Portfolio Standard): it is state requirement for regulated utilities to have specified fraction of their electricity from renewable energy sources. Not all 50 states have RPS (I know FL does not have one whereas 37 states already have either RPS standards (mandatory) or Goals (voluntary). Please refer to the map provided by U.S. Energy Information Administration for states with RPS. Mr. Tilghman mentioned that AZ RPS is based on certain percentage of sales for each of the regulated utilities, with expectation of 15% renewables by 2025. AZ RPS started its infancy in 2000, then through public process, corporation commission hearings, was designed in 2006 and finally implemented in 2007. This lengthy process was well worth it for the state of AZ. In five years, AZ Public Service (largest investor in utility serving greater Phoenix area) as well as Tucson Electric Power & UNS Electric Inc. have all reached beyond the minimum requirement set by AZ RPS. Mr. Tilghman observes that implementation of distributed generation programs, when successfully implemented (as has been the case in AZ), solar installations will continue without any incentives. On behalf of Tucson Electric Power, Mr. Tilghman expresses their acceptance in meeting the challenge in moving forward to renewable energy and have demonstrated their success and willingness in sharing their trials and tribulations with other utility companies throughout USA. Thank you, Mr. Tilghman, for sharing your experience with our viewers/visitor. Any of your comments/suggestions/ questions are welcomed. Tags: Arizona public service, Arizona Research Institute for Solar Energy, AZ public service, AzRISE, Carmine A. Tilghman, Director of Renewable Resources & Programs, EIA, leasing model, Renewable Portfolio Standard, RPS, solar, Sun Is The Future, sunisthefuture, sunisthefuture.net, susan sun nunamaker, Tucson Electric Power, U.S. Energy Information Administration, University of Arizona, UNS Electric Inc. Even though Sun Is The Future is a small organization and has only been around since 2011, we observe the SPJ (Society of Professional Journalists) Code of Ethics. The reason I brought this up is because recently I’ve been asked, by a potential advertiser, to sign an agreement that requires the publisher to give the editorial control to the advertiser. Of course, I did not sign this agreement. But the amazing thing is that the potential advertiser was surprised by my refusal to sign. Apparently many publishers have signed this agreement. So, my advice to every one out there is: READ ANY CONTRACT or AGREEMENT BEFORE YOU SIGN IT ! For independent internet publishers out there, I’d like to share this video clip by the Columbia University School of Journalism. Please always remember the importance of truth, justice, democracy, and journalistic integrity. (Please click on red links below). “In tonight’s State of the Union Address, President Obama laid out a vision for the American energy economy that is in line with what SEIA is working to achieve – a robust clean energy industry that powers our homes and businesses while growing our economy and protecting our environment. Energy is a primary input to our nation’s economic system, so it’s appropriate that President Obama is placing emphasis on developing our nation’s robust clean energy resources to help rebuild the nation’s economy. “We are especially encouraged by the president’s commitment to securing America’s place as a leader in clean energy innovation throughout the world. President Obama understands that the stakes are high and we must not fall behind other nations as the world shifts to emissions-free clean energy technologies like solar. Since 2008, the amount of solar powering U.S. homes, businesses, and military bases has grown by more than 500 percent – from 1,100 megawatts to more than 6,400 megawatts today, which is enough to power more than one million average American households. Solar is the fastest-growing and most affordable, accessible and reliable clean energy technology available today. America’s solar industry now employs more than 119,000 workers at 5,600 companies – most of which are small businesses spread across every state in the union. I’ve debated over and over whether or not to bother addressing this laughable report. But upon further contemplation, I believe it deserves at least a mention because it helps us to realize part of a very serious problem here in U.S. The link at the end of this paragraph is an interview from Fox News. The Fox reporter tells the U.S. public (during a talk show) that solar energy maybe a success story in Germany, but cannot be successfully implemented in U.S. because Germany is a small country and have more sun. This could not be further from the truth! Germany receives less sunlight than Anchorage, Alaska of U.S. ! This Fox reporter also named a list of 1% of solar companies that had failed, without mentioning the other 99% of solar companies that had succeeded. If this Fox reporter has done more home work, she would have discovered that the real reason why solar energy has been such a success story in Germany is due to a successfully implemented incentive policy, Feed-In-Tariff, which I have in the past and will also cover again in a future post. The type of biased reporting by Fox is extremely misleading. In case any one among our visitors/viewers/readers wants evidential support, here is the U.S. Dept. of Energy’s Solar Resource map comparison (provided by NREL, National Renewable Energy Lab) of the U.S., Germany, Spain, Alaska (USA), Mainland (USA), and Hawaii (USA). Here, at Sun Is The Future, though a small organization, we routinely check with multiple sources before publishing any of the posts. This (video of the misleading Fox report) is the reason that Sun Is The Future exists, to correct or supplement what’s been wrongfully or biasedly presented by our network media. We may be small, but we do our home work and we remain faithful to the truth. More truths will come forth in future posts.